Today’s chatter is for glass fusers and is about Glassline Paper. I’ll discuss how and why you might make your own, either because Glassline don’t produce exactly what you want or because you have the time and inclination to make a relatively inexpensive equivalent. I don’t think I’ve inflicted mathematics onto you in previous blogs so now’s my chance. I hope to show you that mathematics (and the scientific method) can sometimes be useful, even when you’re not a mathematician or scientist. If you’re not familiar with Glassline products then a visit here will put you in the picture. Today we’re interested in the Glassline Paper and Glassline Pen products. I don’t often use them myself but there are times when they’re useful. Glassline papers are available in a variety of colours, patterns, textures and sizes. Here’s a picture of a small selection of examples. You’ll find more examples at Glassline’s online shop here and summarised here in a single page. Both links contain information about how to use the Glassline papers. As noted in those two links, Glassline Pens can be used to draw directly on Glassline Paper and I’ll come back to this little fact later when I talk about making your own papers. You can see a colour chart here and you will see the variety of standard colours is not large – but you can mix the colours if you wish. Something worth mentioning for the benefit of novices is that Glassline Pens aren’t pens. They’re flattish bottles of coloured materials that can be fired and you can buy “stick-on” tips so that the bottles can be used as “squirty pens”. As is my habit, I refer you to the Manufacturer Safety Data Sheet (MSDS) page to find out what materials produce which colour and the all-important advice about how to safely use them. 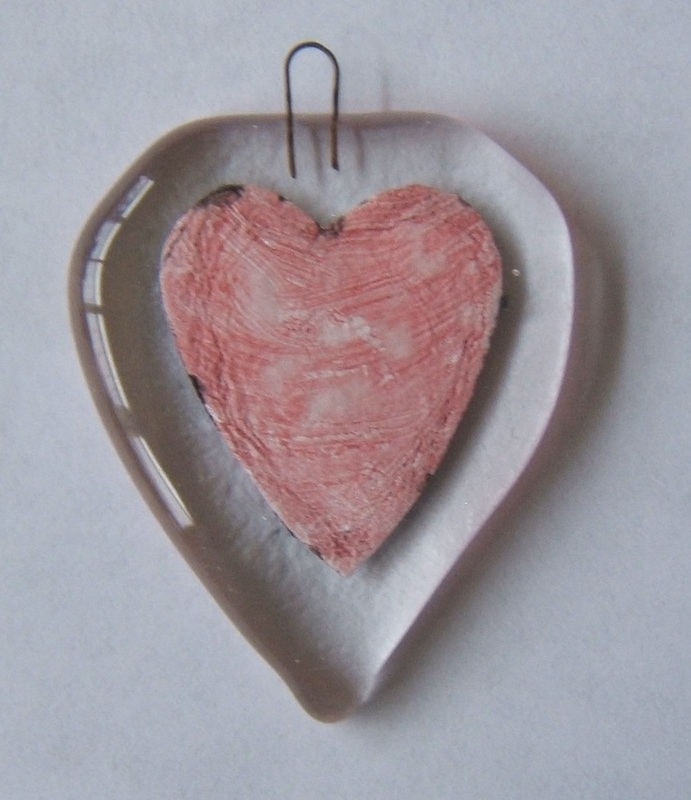 Potters amongst you will notice similarities with materials used in glazes. The picture opposite shows you a couple of example Glassline Pen bottles. Although you can also use a paint brush, an airbrush or whatever else takes your fancy, today we’re only interested in these Glassline Pens in one context – as the colourant for Glassline Papers. Incidentally, Glassline only quote temperatures in Fahrenheit. For future reference, 1500°F is about 816°C and 1000°F is 538°C and you shouldn’t worry if you want to round off the numbers. It is quite some time since I discovered you can put Bullseye thinfire paper between layers of glass. I don’t think I ever remembered to mention this in past blogs so I now apologise and hint that this turns out to be part of what lies behind today’s discussion. More recently I decided to buy a few Glassline Pens and a few small packs of Glassline Papers so that I could experiment with them. Until recently most of the packs of Glassline Paper remained unopened as I rarely find a use for them and have only spent a little time experimenting with them. One of the packs of Glassline Paper I opened last week came with a surprise discovery. I noticed that the obverse (back) of the papers had the familiar logo and markings of Bullseye Thinfire paper. Previous papers did not have the Bullseye Thinfire markings. The picture opposite shows what I mean. Three sheets out of twelve identifying their origin doesn’t sound random to me so I was left wondering if Glassline didn’t intend to reveal what their papers were made from. This is something we will test statistically in the next section. A final realisation was that the Glassline Paper is coloured with what looks like and what feels like Glassline Pen colourants. This is hardly surprising when you remember that Glassline tell us that we can use Glassline Pens on Glassline Paper. If the papers being used at the Glassline factory were unpacked and stacked randomly then we might expect half to be plain-side up and half plain-side down. If Glassline are trying to hide the fact that they use Bullseye Thinfire paper, in an attempt to obscure how their products are made, we’d expect Glassline to deliberately stack their Thinfire paper the same way so that the plain side ends up on the backs of their Glassline Paper, covering the Bullseye logo and markings with the colourants. I have 12 sheets of Glassline Paper so would expect to see the Bullseye logo at the back of about 6 sheets if Glassline doesn’t care which way up they use the Thinfire paper. As already mentioned, I observed just 3 out of 12 having the logo on the back. If this is deliberate bias then it would be interesting to find out more and the Chi-squared test is how we find out. For our statistical test we need to confirm (or reject) our “null hypothesis” that 3 out of 12 is statistically no different to 6 out of 12. If that sounds daft to you, ask yourself these next two questions. Ask yourself “how many children of the same gender can a family have before we decide something weird has been happening” and ask yourself “how many times you can flip a coin and get the same result without getting worried that there’s something wrong with your coin”. We add up the two numbers at the right to get 3.0 and this is our Chi-squared value. We now need to think about “degrees of freedom” because laying a sheet of paper (or flipping a coin) involves the freedom to do something that causes something to happen. Should we decide to lay a sheet of Thinfire with the plain side upwards then we automatically know that the only other possibility is to have had the plain side downwards. Notice that we had two possible options and that choosing one of them automatically determines what the eliminated alternative was. So, two options gives us just one “degree of freedom” to choose. Therefore 1 is the degree of freedom we need for our Chi-squared test. Looking at a Chi-squared table in the row for 1 degree of freedom we find 3.0 is a Chi-squared value that lies somewhere between the columns headed with 0.10 and 0.05. These two column headings are upper and lower bounds on the probability we’re looking for. These numbers can be represented in more familiar ways. Instead of 0.10 you could say 10% or 1 in 10. For 0.05 you could say 5% or 1 in 20. Therefore, in human-speak, the 0.10 and 0.05 mean that 3 out of 12 sheets of Thinfire paper with their plain side upwards will happen somewhere between 10% and 5% of the time when we do our “sampling”. These are quite large probabilities which means our null hypothesis (that there is no difference) is probable. The corollary is that our original hypothesis is not probable. If our original hypothesis is not probable then Glassline aren’t trying to hide the fact they’re using Bullseye Thinfire paper and are therefore not actively using the Thinfire paper one way or the other. Therefore, based on my small sample of 12 pieces of Glassline Paper, 3 out of 12 is no different than 6 out of 12. The same would apply to 9 out of 12. If the whole concept of 3 out of 12, or 9 out of 12, being no different than 6 out of 12 has your intrigued or stunned, I challenge you to analyse some of the statistics behind advertising claims you’ll see on TV or the statistics being quoted by governments or other official bodies. Often you’ll discover the claims are being made on the basis of customer preferences, responses or equivalent measures that are not statistically valid. Knowledge is power. If all that babble left you realising you’ve forgotten all your mathematics then here is where you can revise your Chi-squared test. It’s also where you can find a Chi-squared value table. 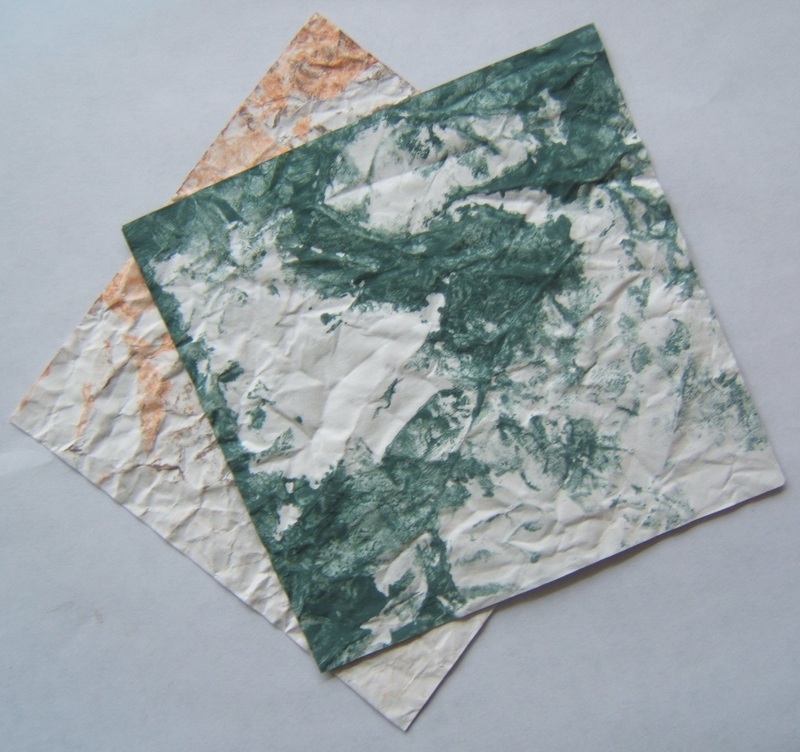 And at long last we come to the most important part of my chatter – telling you what Glassline Paper is made of and how you might make your own equivalent papers. 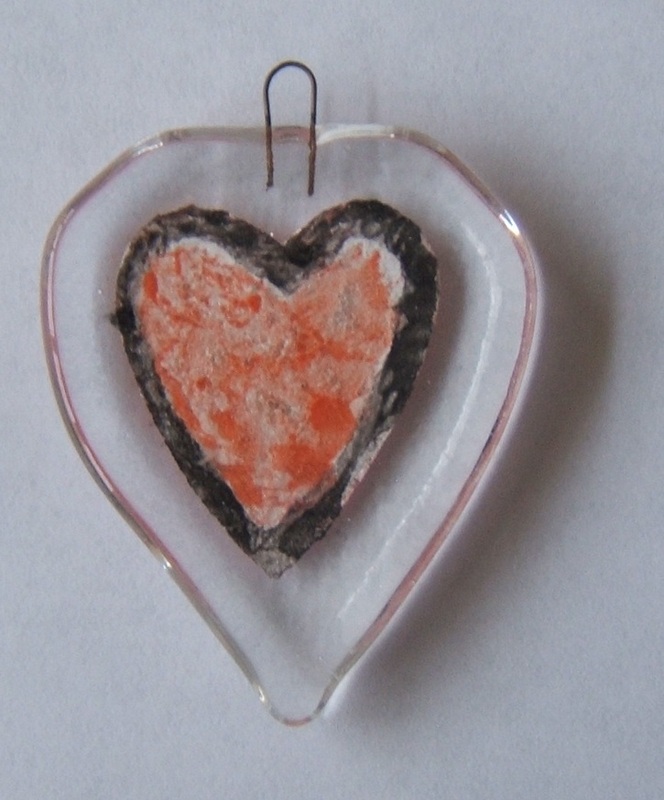 All you need to make your own is Bullseye Thinfire paper, some Glassline Pens and a method of production. There are many methods by which you can apply the colour to the papers. Some of them are mentioned by Glassline. You might use a paintbrush, sponge pad, an airbrush or whatever else comes to mind. Sometimes you may wish to add water to make a thinner mixture, especially when you want to use an airbrush or want to produce a paler tint. Remember also that Glassline tell us that we can use Glassline Pens to decorate their Glassline Papers. Although Glassline Paper tends to have colouring on one side, you will notice in the picture opposite that some papers have overspill on the reverse side. I don’t suppose Glassline care about this overspill beyond recognising it means they’re using more colourant than they’d like to. For us, it means we have to buy papers that are neither single-sided nor double-sided. But bluntly, the backs are an untidy mess. I don’t like mess and it detracts from the quality of what we try to achieve with out work. In these two pictures, on the left and right, you can see that it is possible to have one colour on one side and a different colour on the reverse. It may be a shabby example with sparse artistic merit but it does show us that there is no colour bleed from one side to the other other than my messy experimental workmanship. The picture you now see offers a few examples that show we’re not limited to what Glassline have in their Glassline Paper product range. The grey-looking rectangle will fire to double-sided black. The narrow strip at the top has different colours on each side. The two examples on the right are single-sided and have two colours. The remaining example at the lower left is a single colour of brushed stippling. And finally, do remember that when the thinfire paper has been fired, the Bullseye logo and associated markings will disappear. I think you get the idea and hope these example inspire you to do your own experiments. It is worth considering the relative costs of buying ready-made Glassline Paper against making our own. What follows is a quick analysis that in turn will lead to some simple conclusions. If you’ve had your fill of mathematics then just skim read this section! To begin with we need to know how much it costs to buy ready-made Glassline Paper. For those of you in the USA I offer you the Suede Glassline 5″x5″ Stone Paper kit as an example. For this product three sheets of 5 x 5inch costs $15.45. This equates to about $0.0319 per square cm. By contrast, in the UK we might expect to pay £8.91 or thereabouts for a mix of 15 sheets of 6.5 x 6.5cm at Warm Glass UK. This is a similar quantity and equates to about £0.01406 per square cm. We now need to compare this with the costs to make your own version of Glassline Paper. Bullseye Thinfire paper costs vary depending on how much you buy and where you buy it. For the purposes of our calculations let’s take £19.47 for 10 sheets of 52x52cm quoted by Warm Glass UK. This turns out to be about £0.000720 per square cm. With modest bulk buying the cost of the Thinfire paper turns out to be a negligible cost when heading down the DIY route. 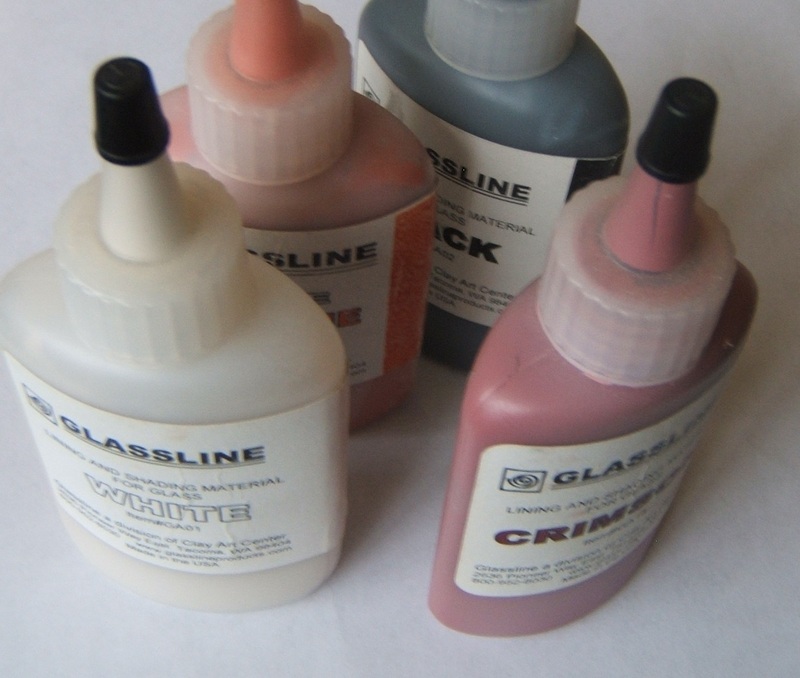 Glassline Pens cost around £7.25 or thereabouts from Warm Glass UK when bought in 2 ounce bottles. That’s about 56 grams for those of you who stopped using Avoirdupois units decades ago. Translating this mass into how much gets used per square centimetre is rather tricky as it depends on what we’re doing and how much water is in the mixture. A light wash of colour is going to use a lot less than a thick coating. All we know is that the colourant is costing us £0.1286 per gram used. Let’s look at the problem in a different way instead. If we can limit our use of the Glassline colourant to less than £0.01334 per square centimetre we’re on a winning streak if we’re out to save money. We know this because we have calculated how much the finished Glassline Paper and raw Bullseye Thinfire papers cost per square centimetre. But how much can we squirt out of a Glassline Pen before it costs us £0.01334? A quick calculation tells us it will be about 0.1037 grams per square centimetre. A tenth of a gram is a tiny amount, nothing more than a blob on the end of a skinny wooden coffee stirrer. However, even a tenth of a gram is enough to cover a couple of square centimetres of Bullseye thinfire paper with a heavy application and considerably more for a light coating. But let’s not forget that we’re likely to find ourselves with mucky paintbrushes, palettes, airbrush equipment or whatever else we’ve been using as tools. Some of what was in our Glassline Pen will go down the drain as waste. Waste costs money too. If you have painterly skills then making your own versions of Glassline Papers is a viable proposition in many situations. Sometimes the cost to buy ready-made outweighs the time and effort needed to produce your own equivalent versions. Sometimes the uniqueness of what you make makes simple cost comparisons pointless. It’s a matter of judgement. A generally applicable comment is to buy cheaply and minimise waste. This is common sense, but a failure to do this can negate your attempts to save money if that’s what you’re aiming for. Heavy coatings of colourant laid on Bullseye Thinfire paper ought to be a financially viable alternative to buying ready-made Glassline papers but three factors should be borne in mind. 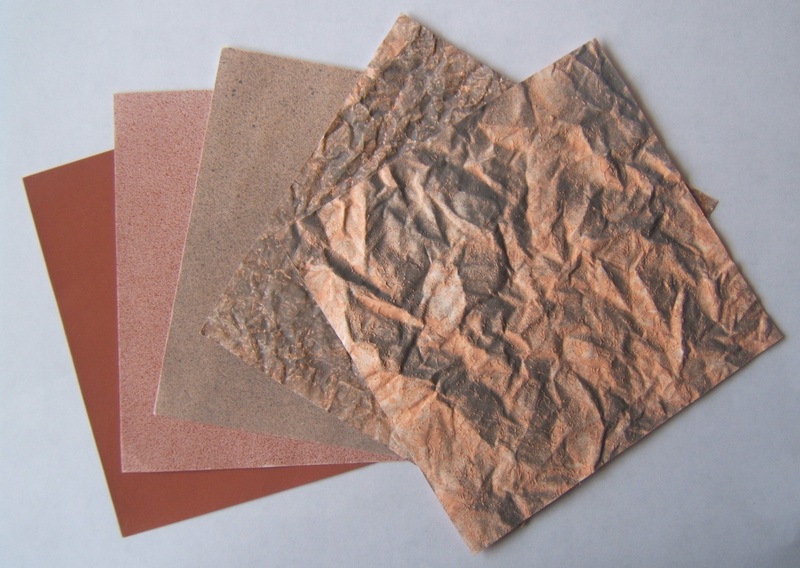 If the thinfire paper is being purchased expensively in small quantities and if the results of the DIY activity result in a lot of waste colourant it is easily possible to make papers that are more expensive than could be purchased ready-made. Also realise that the time you take to make such papers adds to their cost. In extreme contrast to heavy coatings, an airbrush can be used to disperse small quantities of watered-down colourant over a large area as speckles. This method ought to be the least costly because it uses the least quantity of colourant. Do remember that airbrushing speckles will only be financially viable if you already own an airbrush. Related to speckled effects would be brushed effects, drawn effects or sponged effects, especially when watered-down colourants are being used. Again we should expect relatively low costs that are viable compared to ready-made papers. Some of the Glassline papers will be harder to replicate and will use a lot of colourant. 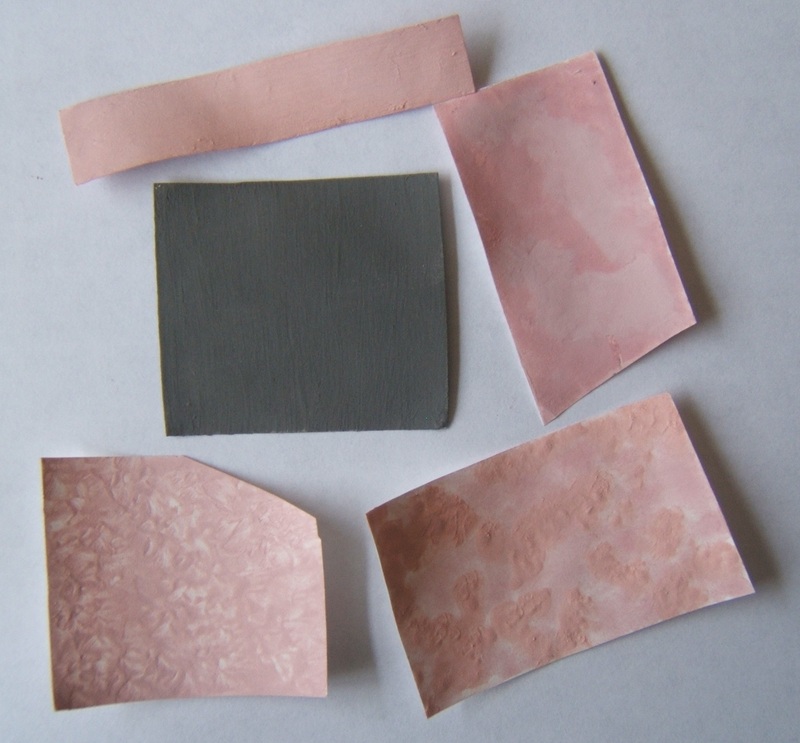 Examples of the crinkled, granite and sandstone papers where Glassline use two colours and/or the thinfire paper that has been “crumpled” and flattened-out before applying the colourants. Unless there is a compelling reason to make your own I reckon it’s not worth the trouble to make these at yourself, other than as experiments for the learning experience. Not only will it be a time-consuming task but the amount of colourant and waste colourant are likely to make it more expensive than ready-made papers. A final conclusion is that we now realise that Glassline papers with overspill on their backs can be “finished off” to make them double-sided rather than “single-sided with mess on the back”. It may not matter to Glassline, but I try to consider how things look from the back of what I make. In the final analysis, the most compelling case for producing your own papers is when you want to colour both sides of the thinfire paper and when you require colours or patterning that can not be obtained ready-made from Glassline. This entry was posted in Experiment, Glassline Paper, Glassline Pen, Inclusions, Money-saving ideas and tagged Bullseye, Experiment, Glassline, Glassline Paper, Glassline Pen, inclusion, Money-saving ideas, Thinfire. Bookmark the permalink. Thank you for the back-link to my blog. I see you’ve having some fun with experiments. Thanks for your experiments. I’ve been wondering about how to make something similar to Glassline liquid itself. Could it just be glass powder and ?water. Or some other liquid component? Any thoughts on that? Hello Jonathan. If you meander around my blogs you’ll see that I have been using CMC as a thickener so that glass powder gets suspended in water. I hope this is what you’re thinking about – see my “Squirt your frits” in particular.